Running brew list will show a list of all your installed Homebrew packages. In addition, brew cask list will provide the items installed using the Caskroom. brew leaves shows you all top-level packages. That is packages that are not dependencies. This should be the most interesting if you are using the list to re-install packages. brew bundle may also be interesting if you are asking because you want to manage your brew installation. This includes casks, which brew list does not. It is aimed at having reproducible Homebrew setups. You can use the --global flag to operate on your ~/Brewfile and -f to force overwriting of your existing file (for installation, this will force uninstallation of not-listed packages). 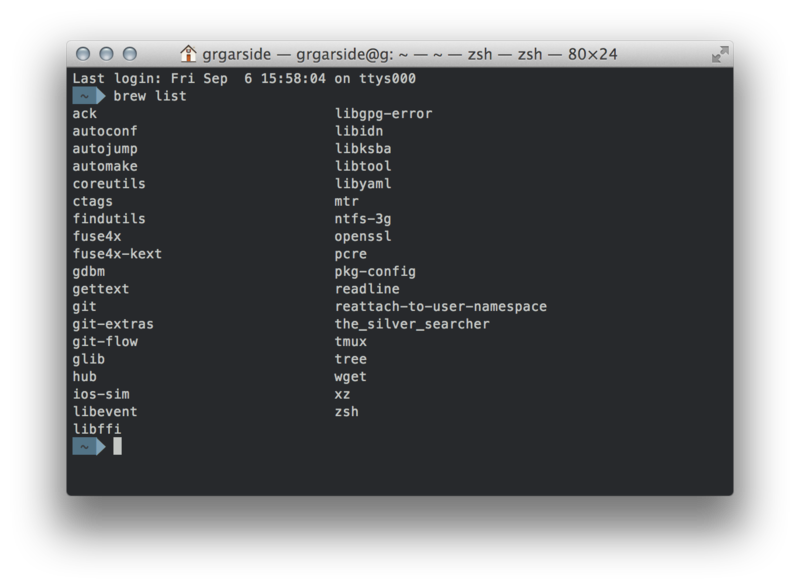 Executing brew list command shows a simple, alphabetically sorted list of all the installed packages. The independently listed packages (e.g. gdbm and openssl in the example output above) have no dependencies. The packages depicted as part of a tree structure have their dependency listed at immediate lower level (e.g. package sqlite requires that the package readline to be installed). The packages listed at leaf nodes in the tree structures have no dependencies. Dependencies visualised in a tree structure can help in easily getting rid of the unnecessary packages. You may use brew list | grep 'package-name' or if are looking for specific package. brew list 'package-name' also works and provides additional information. Way to determine most popular Homebrew packages? List of all installed packages in a defunct Homebrew installation? Show installation date of packages installed with Homebrew?